Will her cygnets be unable to breed if they can’t find garbage to nest in? Nesting, a photo by webmink on Flickr. I spent a half-day walking around the centre of Amsterdam following a speaking engagement. I can never decide how I feel about this city. It’s a place with many scenes of great beauty – water, trees, long vistas with distant vanishing points, interesting and colourful buildings. Yet at the same time, there’s so much that’s ugly – prostitutes and the men looking for them, clouds of skunk-smelling smoke from seedy cafes and equally seedy passers-by, over-dense human population and the mess that accompanies it, endless junk food served by people with scorn for their customers. 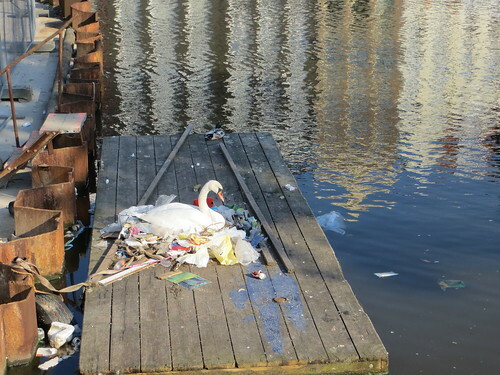 Walking back to the station, I saw this swan nesting in the best material she could find in central Amsterdam. She seemed to me to sum up the paradox of the town – great beauty nesting in filth and making the best of it.